“Mike, MotoIQ has to try our Ran-Up oil treatment”, RS-R's John Masuda would say to me every time I saw him over the past year. “It gives you 5-12 more whp in our testing and I really want you to try it”. Yeah right I would think. Sounds too good to be true. Not wanting to test something we didn't think would work we had to wait for John to show up one day at our office door with a box full of Ran-Up oil treatment. “Try it”, he insisted, “you can try it on your dyno or our dyno”. Our friends pro drivers Ken Gushi and Dai Yoshihara had tried the stuff and told us they could feel the difference. First we should probably explain what Ran-Up is. It is an oil additive with an unusual constitution. It is a 0-20w synthetic oil full of ceramic nano particles that act like billions of miniature ball bearings in your engine. The particles are so tiny they pass right through your oil filter and stay suspended in the oil. The particles are very small, hard and very round. They work exactly like tiny ball bearings to reduce friction, metal to metal contact, vibration and greatly reduce wear. These properties also improve power and fuel economy. The easiest mod ever! Just pour it in and drive 30 minutes. Project GD STI is the first test dummy for Ran-Up in the MotoIQ fleet mostly because we had just changed the oil. Ran up should make a difference in this engine but it usually makes a bigger difference in engines that have more friction like ones with more cylinders and diesels. 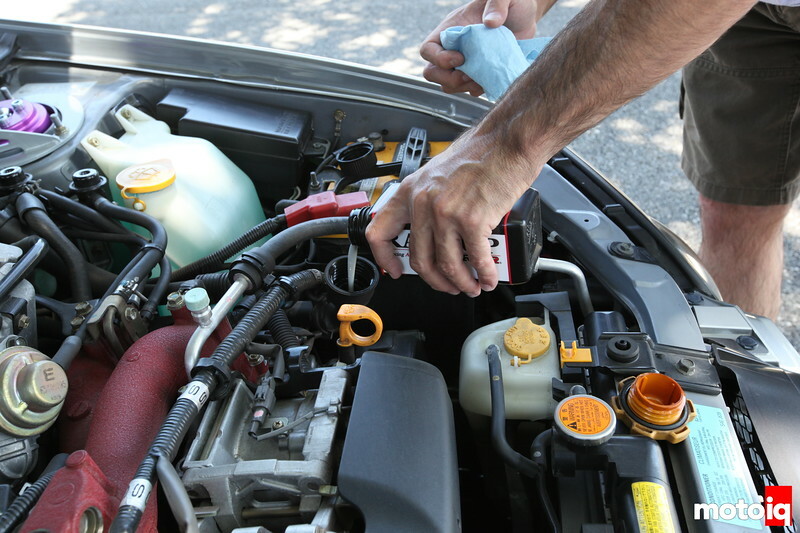 Using Ran-Up is as easy as simply pouring it into your crankcase and checking to make sure your oil is not overfilled. 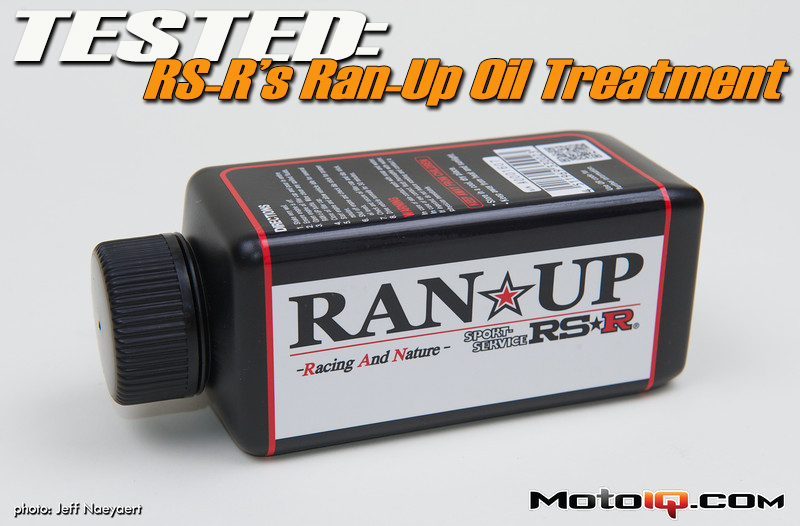 One bottle of Ran-Up treats up to 8 quarts of any kind of motor oil, synthetic or mineral. Ran-Up works on all 4 stroke, rotary and diesel engines. RS-R warned us not to try it in two strokes which bummed us out because we race karts and scooters and we were eager to try it in those small high revving engines. RS-R also warned us not to use Ran-Up in anything other than the engine's crank case, this means don't put it into transmissions or differentials. Ran-Up's benefits become apparent after the car is driven for about 30 miles, which allows enough time to burnish the nano particles into the metal and will still be present after an oil change although its effectiveness may be reduced. To give Ran-Up a quick and dirty test, we first decided to put it into our Project GD STI mostly because we had just changed the oil with brand new Moble One 0w40 in the crankcase. RS-R told us we would probably see a gain of 5-7 hp as this is a 4 cylinder engine. They typically see larger gains in engines with more cylinders due to higher amounts of internal friction. After shaking the bottle thoroughly we carefully dumped it into our Subies crankcase noting that the additive was a milky gray in color. Once that was done, we set out on a 30 minute freeway drive to burnish the additive into our engine's metal parts. 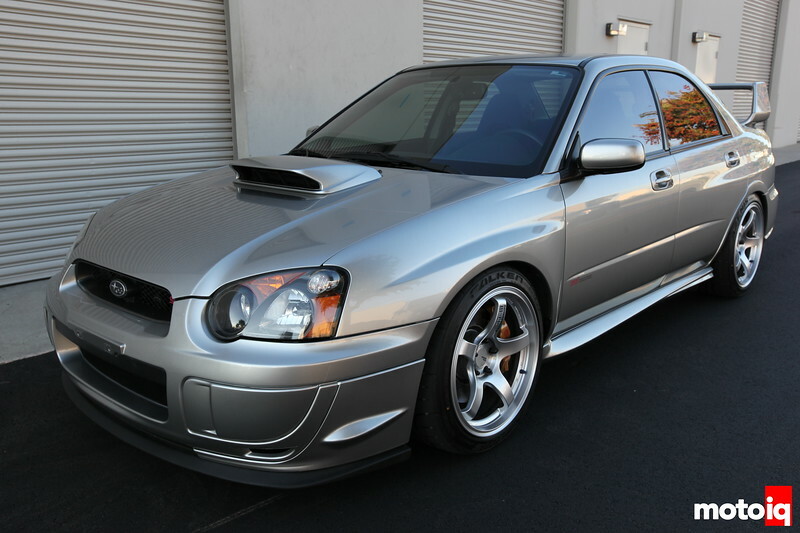 Our Project GD Subaru STI was our first subject for testing RS-R's Ran-Up oil treatment. During our drive we noticed a few things. On a Subaru you can usually hear the whine of the turbocharger quite well. This is because the turbo is mounted up high and close to the firewall. Normally when going down the freeway, you can hear a continuous whine from the turbo, even at light throttle. The first thing we noticed is that the whine disappeared after a few minutes. Next we noticed that our idle had become very smooth and you could definitely feel less vibrations from the engine. Being skeptics of super additive claims, we were pretty amazed at these two things alone. After our drive it was time for a subjective test. Our friend Naji Dahi of Looney Tuning lives nearby and he dropped in to give us a hand to try to measure any power gains that Ran-Up might provide. If you drive an Evo or an STI Naji is a hell of a tuner. I’m very pleased to see you guys actually dyno test this product! I’ve used a similar product Ceratec in my GDB and noticed it made the engine feel extra smooth and stronger for about 1000mi. Afterwards it faded away. Others have mentioned they see slightly lower oil temps, perhaps due to reduced friction not heating the oil as much. I bet Ran-Up is the same thing as Ceratec; they both seem based on some aerospace derived ceramic particle lubricant. For 50.00, I hope it’s lasts longer that.